I love fried rice in general, and crab fried rice in particular. The flakes of crab work really well in fried rice, better than most other meats. Fried rice is essentially a “garbage plate” dish made with whatever is lying around. Toss it all together with an egg, last night’s rice and bam, there’s dinner. I got the idea for my crab fried rice from an excellent primer on preparing Asian food called Healthy Asian Favorites, which is perfect for home cooks living outside the big Asian centers of this country. Full disclosure: It’s written by my friend Jaden Hair of Steamy Kitchen. This is not an in-depth book on Asian cuisine, not is it intended as such. For example, Jaden’s Korean kimchi recipe can be made in 15 minutes. My version requires at least a week… and a month is better. This is a book for novices, busy family cooks or hunters and anglers looking for a simple, honest guide to help them break into Asian cooking: Almost all her recipes can be made with wild game or fish. After all, Jaden’s husband hunts and they are both avid anglers. Which brings me to this recipe. 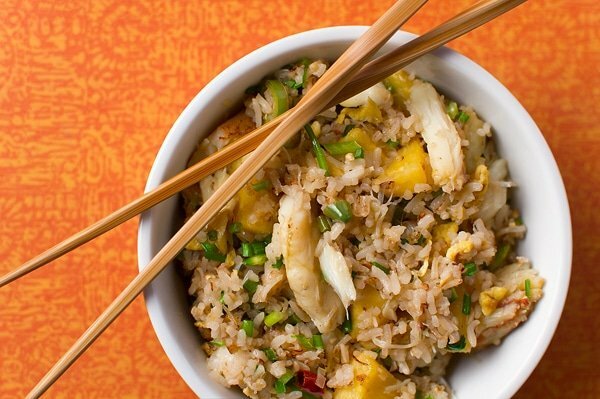 Jaden’s pineapple crab fried rice can be made with any sort of crab. Lots of Asian countries make fried rice, and looking at her recipe it’s clear that this is at its core a Thai or Vietnamese fried rice; the fish sauce is a dead giveaway. Fish sauce, if you’ve never heard of it, is sorta like soy sauce only it’s made from the juices of heavily salted anchovies and such. It virtually identical to the Ancient Roman garum, which Caesar splashed on everything. Tastewise, the kind you can get in most American stores is crystal clear, slightly funky and pretty salty. Always look for clear fish sauce: If you shop in Asian markets, you’ll find some ferocious fish sauce with lots of… debris in it. Nasty, gnarly stuff. Fortunately, fish sauce is getting really easy to find these days. I’ve seen it in markets in places like Gloucester, MA, Billings, MT, and even in Booneville, MO. Keep in mind this is not Jaden’s exact recipe. Like I said before, I have access to all sorts of Southeast Asian ingredients here, so I’ve kicked up her recipe quite a bit. If you want to get close to her recipe, leave out my optional ingredients. If you want her exact recipe, you’ll have to buy the book. This can be made with any sort of crab. You can get those refrigerated jars of pasteurized crab meat that are good. I used fresh pineapple, but you don't need a whole pineapple for the recipe. So canned will work if you don't feel like eating the rest for a snack. If you are a novice to fried rice, the one vital thing you need to remember is to start with cool cooked rice. I usually use day-old rice or at least rice I've made in the morning. Once made, this is best eaten immediately, although I've reheated it for lunches later and it was OK.
Heat 1 tablespoon of the peanut oil in a wok or large, non-stick saute pan over high heat. Use your hottest burner, too. The second the oil begins to smoke, pour in the beaten eggs and swirl them around in the pan to coat it in a thin layer. Let this cook for a couple seconds, then use a spatula or wooden spoon to break it up into pieces. Tip it out of the pan and into a bowl. Set aside. Wipe the inside of the wok with a paper towel and add the remaining peanut oil. Let this heat up for a minute or so, but don't let it smoke. Add the chopped green onions, ginger, lemongrass and Sichuan peppercorns and stir-fry for 30 seconds to 1 minute over high heat. 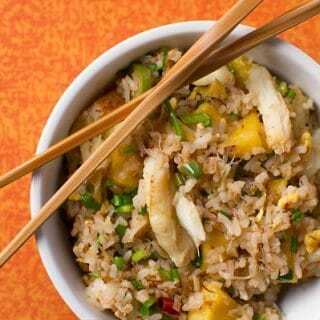 Add the rice, crabmeat, pineapple, cooked eggs and fish sauce and stir-fry for 2 minutes. Now let the mixture cook undisturbed for 1 minute; this gives it a little color. Toss well and repeat the process for 1 more minute. Turn off the heat and mix in the cilantro. 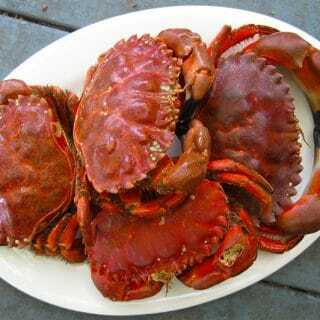 You can find all sorts of recipes for crabs and other shellfish here on Hunter Angler Gardener Cook! 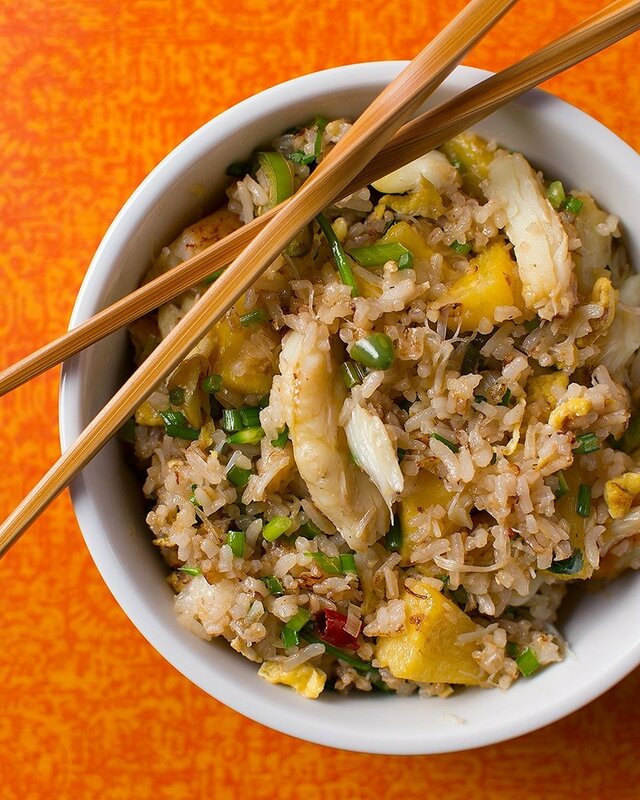 You know what makes the best crab fried rice? The guts! Or the “butter” if we want to be all classy about it. My mother makes a spectacular dish out of just the butter and rice sauteed with green onions and black pepper, but I bet it’d be amazing in this version. Have you done a post on crab butter yet? It seems right up your alley.